The Shanghai Tower will be the tallest building in China by its completion in 2014, but that is not its biggest accomplishment. The term “vertical city” has been used to describe the cornucopia of spaces that it will offer including Class-A office space, a luxury hotel, high-end retail, and event space. This aspect still pales in comparison to the building’s biggest accomplishment, its innovation in green design. With wind turbines, a complex rainwater collection system, two envelope layers that surround nine interior sky gardens, and an ingenious design that mitigates lateral loads from wind and reduces the necessary structural steel by over 20 percent, this building is setting the bar high for super-tall buildings. Remarkably, all of these sustainable strategies are being implemented in China. To further explain the design process and to prove that sustainability in China is not that surprising, I asked Gensler’s Director of Architecture for the Northwest Region (who is speaking on behalf of the Shanghai based project team) a couple of questions regarding sustainable building in China and how the Shanghai Tower epitomized the emerging trend. CleanTechies: I wanted to start off by asking you what the marketplace is like for sustainable building in China. Is it as popular or as big in China as it is in the United States? Weingarten: That is an interesting question because on the one hand you could argue that it has never not been popular because a lot of the practices indigenous to other countries are typically more sustainable then what we are accustom to. So we come over there and say “well we are going to talk to you about being sustainable” and they say “we are already are, we already have wastewater and recycling programs”. In Europe they already all shop with reusable bags. It’s kind of an Americanize view if you take that perspective; if you don’t embrace their cultural phenomenon. When we come in we don’t just talk about the US Green Building Council, which is a benchmark here, we talk about global sustainability. There is such booming economic growth in China and India that these issues have been present there for along time. Sustainable agriculture, indoor air quality concerns, getting rid of coal burning power plants, these are issues that have been very prevalent in those regions for a while. CleanTechies: That is very interesting and quite different than what most Americans would expect. How did the Chinese bureaucracy affect your project? Weingarten: The Chinese government has a strong commitment to developing the future of Shanghai as a financial center on par with New York and Los Angeles and where there is a will there is a very strong way. So we are not getting tied in up the typical bureaucratic issues we normally run into. This project is a priority. It is great to be on a project that is on the fast track and that is well liked. That certainly helps. CleanTechies: Is the Chinese government’s influence a factor when you are looking at sustainable practices? Weingarten: They are pushing for more. We are not just doing because it is an ego `statement; we are doing it to show China’s emersion as green, clean and sustainable. There is such an urban vitality there and this project is building on the standard they set with the Olympics. CleanTechies: How similar is the China Building Council to USGBC? Weingarten: Well we were using the China Star Program and it is very similar to LEED. I think the core tenants are all the same. The performance metrics are based on a different set of regulations. We use ASHRAE, and sometimes they use ASHRAE but sometimes they use something else. CleanTechies: But in general they are pretty similar? Weingarten: It translates very well. CleanTechies: Is the popularity of the China Star Program on par with LEED in the United States or is it in its beginning stage? Weingarten: It is pretty popular because the Chinese are very proud of their system. CleanTechies: I also wanted to know a bit about the sustainable practices you implemented in this project. The rain collection system was really interesting as was the wind turbines you implemented. Where exactly did you put the turbines? Weingarten: Well, it’s a 662-meter building and up that high the wind is very strong. In a super- tall building the wind is both your friend and your enemy. Once you get above 80 stories most private brokers will tell you that the economics of the building don’t pan out, because you have so many structural considerations because of the lateral load. With this project we designed the building to mitigate the wind forces by using a curved shape. We were able to save 25 percent of the ton steel tonnage by not presenting a broad face to the wind. By allowing the wind to flow aerodynamically we mitigate direct lateral pressures. We also made use of the Diagrid System, which allows the wind to flow in a natural way instead of orthogonally like with classic designs. 25 percent savings is huge in the scheme of things. CleanTechies: How was the whole process of designing the structure to use 25 percent less steel but still hold up to the shearing force of the wind? Weingarten: We reached a point where we have the technology to accomplish this. Early on it was about technical achievements. It was about figuring out how to design a super-tall building to stand at all. Now we have the technology and we can look to incorporate architectural aesthetics in these buildings in a much more integrated way. This building embodies the integrated design process. The skin, the structure, the façade, its all designed to increase the efficiency of the building. The way this works, you have got this aerodynamic shape and every 14 floors you have what is called an outrigger truss. That acts like your shoulder. The outrigger trust broadens the base of the building. The broader the base the better it supports itself. A big tall thin building will move more than a tall broad building. What that enables us to do is create a double skin. We built a space between the inner skin and what’s really the façade of the building. That creates a sky garden. That sky garden acts as thermal buffer so you don’t have the climate coming right to the face of the building. What that means is that instead of having a completely opaque building you have a clear one. Most skycrapers are essentially opaque to the outside because of the high reflectivity of their windows, a necessity to limit solar heat gain. With the Shanghai Tower, because the façade is not in direct contact with the outside, we could make it completely transparent. For the first time in super-tall buildings, you will be able to see occupants in the sky gardens, and you get a strong visual connection not only from the inside but also from the outside. With other buildings it is like wearing sunglasses. When you are the street you have no idea what’s going on inside. These experiential sustainable practices are so important to the industry especially with architecture. We have the ability to improve energy efficiency and use daylighting controls, but if we can bring a noticeable change to a building that the tenants will see and feel, that is really the future. CleanTechies: There has always been an issue of how to make buildings green and look good? How do you combine sustainable building and building aesthetics? Weingarten: You have heard of the term “vertical city.” This is the first time I think we have actually seen that truly realized. There have been other projects that have claimed to be a vertical city but you can’t really have a vertical city if the building is not transparent. You can imagine that there is quite a contradiction as the building is in China, which is seen as closed. Its communist and this project is open, transparent. CleanTechies: Thank you so much for meeting and discussing the future of sustainability in China. I think your blogger should talk with the designer of the Shanghai Tower, Marshall Strabala. Check him out on wikipedia.org and his 16 pages on Google. 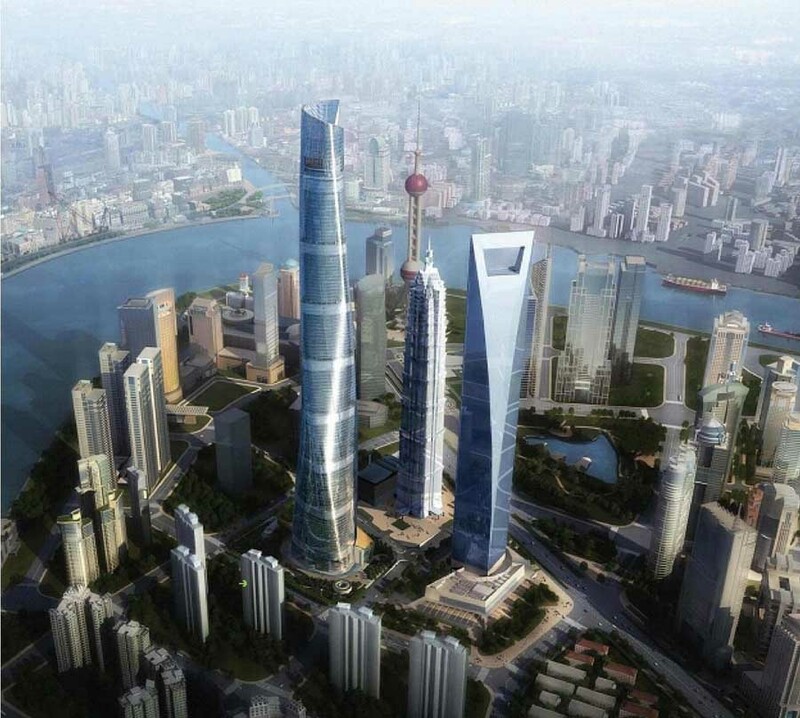 Shangahai tower is a good design for good bussines, good job Gensler..